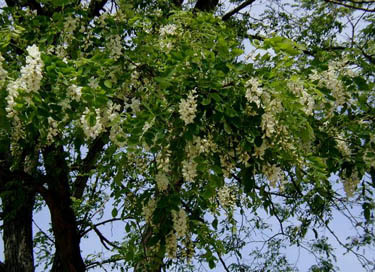 Black Locust is an anomaly in the woods. It grows very fast in its first twenty years of life, then slows down. It is one of the densest woods in the forest and it will last for generations to come. It is not toxic to humans and most animals. The leaves were used in past times as fodder for sheep and goats. Horses cannot tolerate the bark as it will make them sick, once the bark is removed from the posts it does no harm. Black locust is the most durable hardwood in North America.It does not need anything done to it as one of its properties is that it does not absorb anything, this is why it lasts so long. In historic Jamestown, how they found where the original settlement buildings were located was due to the fact that black locust posts were still sound in the ground! Because there is very little sap in the tree it is one of a few species that can be burned green as firewood. It also has the second highest BTU's. We utilize every part of the wood, for us there is no waste. A precious gift from our creator. Indigenous peoples used the flowers for food, the seedpods for medicine. It will take oil or paint but cannot absorb stain. It weathers to a lovely grey. As it ages it gets harder and harder. In order to use it one must predrill holes for fastening.